Political cartoon by Rodrigo / Expresso. The cartoon above may seem funny to a lot of people, but I suspect those would be people who currently have a decent job. 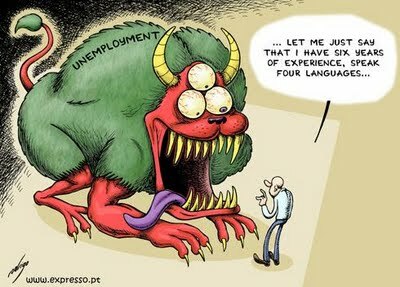 For those without jobs the monster of unemployment is all too real (and very frightening). They know that looking for a job is much harder than actually working, and nobody lives large off an unemployment check (if they're lucky enough to receive one). The Labor Department released it's monthly unemployment figures last week. The headline that most pundits want to talk about is that somewhere around 244,000 jobs were created in April (that fact is trumpeted in the first line of the report). But before you get carried away with celebrating this "good news" you need to know the rest of the story (and it's not a pretty story). Even though those jobs were created in April, they didn't even make a dent in the unemployment rate. In fact, the unemployment rate actually climbed in April -- from 8.8% to 9.0% according to the government. That means the unemployment situation got worse instead of better. Consider the following numbers. The Labor Department says the number of unemployed people is currently 13.7 million. But that is just the number of unemployed people that the government could verify looking for a job in the last four weeks. They also admit there are at least 2.5 million people who are out of work, but have virtually given up and it could not be verified that they looked for work in the last four weeks (although that figure is just a guess and is probably much larger). But just for grins let's take the government figure of 2.5 million people "marginally attached" to the work force. Add that to the 13.7 million still actively seeking work and we get a figure of 16.2 million people who can't find work. Then we have the people who are working part-time because their hours have been cut back or they can't find full-time work (and all of these people would like to get a full-time job). There are 8.6 million of these people. Add that 8.6 million to the 16.2 million and you get a better picture of the number of Americans who would like to have full-time jobs but can't find any -- and that number is 24.8 million people (between 16% and 17% of the workforce in this country). And there is little doubt that that is a low-ball figure (since the marginally-attached people are pretty invisible and very hard to count). The truth is that the recession is still raging for working people and it got a little worse last month (in spite of the positive job creation). Now the economists say that an unemployment rate of about 3-4% is considered to be full employment (since there will always be some movement with people quitting jobs or moving and looking for new jobs). At 4% this would be around 6 million people. That means we have 18.8 million Americans (or more) who would be working if the economy was healthy, but are currently unemployed. To show you how really anemic the creation of 244,000 jobs is, it would take 6.5 years to put those 18.8 million people back to work -- and that is only if no new workers entered the job market in that 6.5 years! But since the unemployment rate went up even though 244,000 jobs were created, we can assume this number of new jobs didn't quite cover the number of new workers entering the job market. The sad fact is that it will take many, many years to put most of America's unemployed back to work -- and then only if the economy is booming (something we can only dream about right now). And if we continue to follow the Republican economic policies, the current unemployment rate might last far into the future (if it improves any at all) -- because they and their corporate masters like the current situation (because desperate workers will accept very low wages and no benefits). Some right-wingers will say that there are jobs to be had if a worker is willing to lower his or her expectations. Even that is not true. Consider what happened when McDonald's (a company known for paying low wages with few benefits) announced they would be hiring thousands of new workers. Over a million people applied for those pitiful jobs -- and about 62,000 people were hired. That means over 938,000 people couldn't even get hired for that low-wage company. And while the politicians talk about abolishing Medicare and Medicaid, cutting Social Security benefits, and slashing social programs (including food stamps and unemployment insurance) -- while giving corporations subsidies and cutting taxes for the rich -- there is absolutely nothing being done by the government to solve the jobs problem. Is it any wonder that ordinary Americans are mad at both political parties? Don't let the politicians fool you. The rich are doing very well, but the recession is still raging for most Americans -- and it looks like it will be for quite a while.